Calling all Veterans! Please come and join us at our 8:30 AM Mass on Wednesday, November 14, 2018, as we celebrate and honor the dedicated men and women of our Armed Forces. After mass, we will have a Continental Breakfast in your honor in Room 4. Please submit the attached flyer to be recognized at our mass. 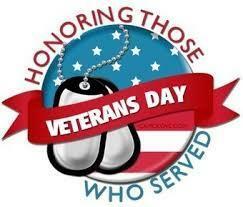 Thank you and God Bless!